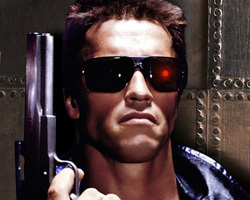 If you want to look like Terminator with his red glowing eyes, try ColourVue Glow Red contacts and enjoy their freaky effect under disco light. With ColourVue Glow Red contact lenses you will have no problem turning into Terminator - just make sure you are in the club with UV light and your eyes will glow with juicy red color, just like in the movie! When outside of a club, in daylight, these lenses still give you an amazing look with their bright red coloring. Try now these fantastic terminator contact lenses!